Item CLI46114. C-Line 46114 shop ticket holders are strong and rigid. Metal eyelet at top for hanging. Reinforced stitched shop ticket holder. Clear vinyl holders for a clear view of your document.11" x 14" and open on the 11" side with eyelet on the same side. 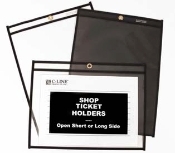 Plastic ticket holder withstands the daily use of the shop environment to provide a long lasting job ticket holder.